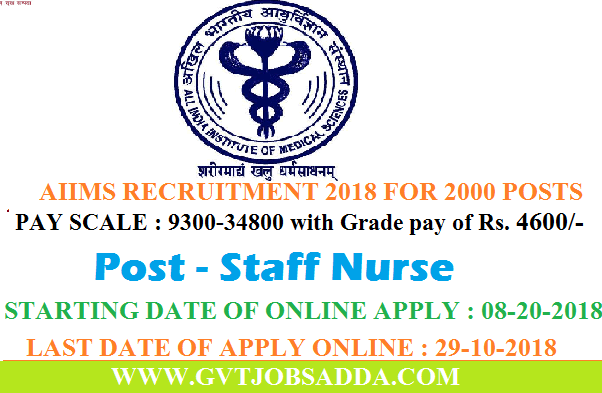 All India Institute of Medical Sciences, New Delhi on behalf of AIIMS Bhopal, Jodhpur, Patna and Raipur invites Online Registration for the post of Nursing Officer (Staff Nurse-Grade-II)- Group ‘B’ on Direct Recruitment Basis for 2000 posts.Those candidates who are interested & eligible for the recruitment may check the vacancies details and apply before last date of online apply 29-10-2018. Brief information is given below. EDUCATION QUALIFICATION : Candidates should have passed B.Sc (Hons.) Nursing/B.Sc. Nursing or B.Sc. (Post-Certificate)/Post-Basic B.Sc. 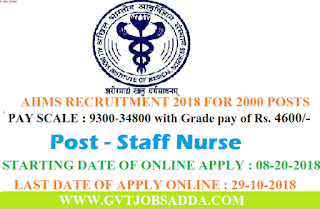 Nursing and registered as nurses & midwife in State/Indian Nursing Council OR Diploma in General Nursing Midwifery and registered as nurses & midwife in State/Indian Nursing Council with two years experience in minimum 50 bedded hospital.